The one hour level 1 class is for girls ages 6 and up. Students learn cartwheels, various rolls, handstands, pull overs, proper running form, squat ons, beam walks, jumps, turns and so much more! Our USAG certified instructors focus on proper stretching and practice body shapes to teach the fundamentals of gymnastics. Students come to us with different strengths and we challenge each child individually with exercises in which she can find success. We train on the following events: vault, bars, beam, floor and trampoline. 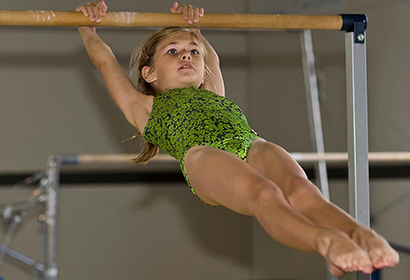 Specific USAG skills are taught that lay the foundation for building not only strong gymnasts but also provide an excellent base for lifelong fitness. The Level 2 class is an hour and a half long and by invitation only. Students are invited into the class after completing the Level 1 program by properly executing skills from our USAG-based curriculum. Instructors focus on building skills like round offs, back bend kick overs, handstand forward rolls, turns on balance beam and vaulting to handstand. We focus on proper stretching, use strength and conditioning exercises and drill skills to create proper muscle memory. The Level 3 class is two hours long and by invitation only. Students are invited into the class after completing the Level 2 program by properly executing skills from our USAG-based curriculum. Instructors focus on building skills like vaulting to handstand, hip circles on bars, back walkovers on floor and handstands on beam. We focus on proper stretching, use strength and conditioning exercises and drill skills to create proper muscle memory. San Diego Gymnastics instructors enjoy coaching and teaching lifelong lessons!